Often my parties have a unique theme which the guests may or may not know about. I usually try to put info around for guests to find throughout the party. The only thing O wanted for his party was a bounce house. But our backyard isn’t big enough for one and so I thought it wasn’t going to work out. Then our friends, Jimmy and Vanessa, offered their small bounce to use! O was SO happy. A HUGE thank you to them! Since my son is really in to music and because Ziggy Stardust is a rock star, I decided to set out all the toy musical instruments we had for the kids to play with. This is sweet K. If you look behind her you can see my fabric backdrop that I put up for the kids to jam in front of. You can just barely make out the other feather garland made by Jenny. How rad are K’s nails? Here is a picture of Jenny’s garland I took after the party. How gorgeous and fun are all those feathers? These garlands must have taken her forever and I am so grateful that she made them for me!!! 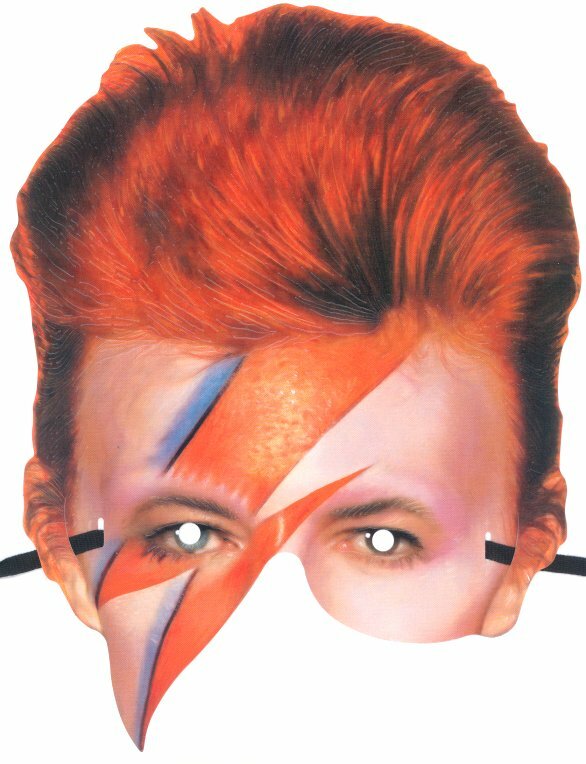 I saw these masks in random blog posts around the web after I started planning the party. I knew I had to have them. Here is the link. They print out small, pretty much kid sized, so if you want them for adults you need to blow them up a little. I decided that we needed to do another smash cake like the one we did for my other son’s party. I asked Kristin of Meringue Bake Shop to make it this time because I wanted it to be way cuter than the other. :) It turned out super cute. And the kids go wild! I then cut the cake and let the kids go to town. I don’t provide plates or silverware. Its a free for all. It is one of my favorite party surprises. This cake was vegan and the candy was friendly to O’s allergies. I’m going to wrap up the party tomorrow with a collage that will hopefully share the feeling of the whole party and since I know that some people don’t enjoy such long posts as all of them from this week, then they will have a quick post too. Probably should have posted that first…whatevs. LOVE ALL OF THIS! And Congrats on the Hip Hip Hooray post too! What a cool party and what a cool mom you are! Love these pics!! So bummed I missed this part. Everday I think I fall more in love with this party. Such an awesome theme!